I first became aware of The Dinosaur Lords back in November of last year. Once I got wind from Victor Milán that ARCs were appearing in the wild, I began (politely) begging for an ARC in April of this year - and Tor Books were quick to oblige. As you can guess, I pretty much devoured it the week that it arrived, but I sat on my review until now, having been asked to wait until closer to the release date. 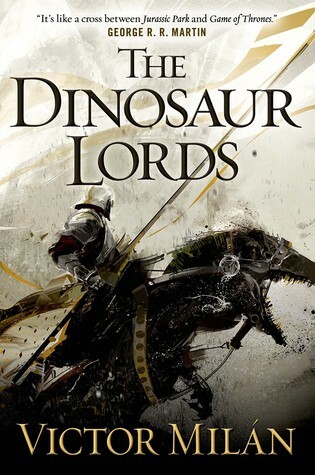 What we get here is exactly what the cover blurb promises - an historical fantasy, with all the religious and political conflicts of 14th century Europe, told with both brilliant snark and violent flair, regaling the reader with the exploits of dinosaur-mounted knights. Yes, you read that right, armored knights riding into combat atop armored dinosaurs, themselves selectively bred for battle. It sounds impossibly awesome, almost too good to be true, but Milán completely pulls it off. Before I get into the story itself, let me just talk for a moment about how this is presented. Each chapter begins with a gorgeous woodcut style illustration, presenting the reader with a starkly beautiful 14th century rendering of a dinosaur, complete with armor and rider. 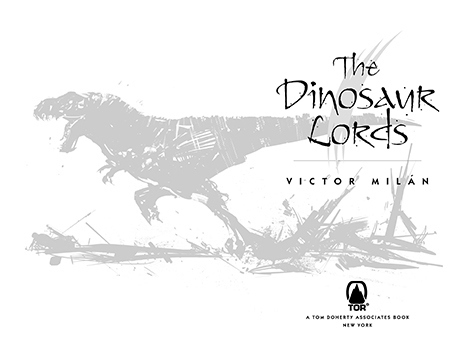 Accompanying each illustration is an entry from The Book of True Names, providing the common name, scientific name, and battle summary of the dinosaur in question. 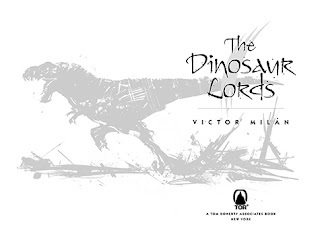 While Milán takes some liberties with his species, and the naming conventions are from an alternate timelines, the dinosaurs are all instantly recognizable, and the details allow us to better envision just what kind of terror stalks these battlefields. As for the world-building, it goes far beyond the dinosaurs. The religion and politics here are recognizable as being of the 14th century, but Milán has invested a lot of time and effort in subtly tweaking their evolution in this alternate timeline. It's a deep story, with a lot of layers, and I daresay it even gets bogged down in the regal minutiae from time to time. I appreciated the amount of detail, and probably would have been far more patient/interested were this a different book, but I freely admit to just wanting to get back to the dinosaurs. Having said that, those scenes are done well, and are what truly earn it the "cross between Jurassic Park and Game of Thrones" comparison from George R.R. Martin. I will admit to no minor amount of curiosity regarding the Grey Angels but, really, I generally just wanted more dinosaurs. In terms of narrative and storytelling, this is a really fun read. Milán knows his story is just a touch absurd, relying entirely on almost childish wish-fulfillment, and doesn't attempt to cover that up. There's no attempt here to put a serious, dramatic veneer on the fun, to force a measure of respectability onto the tale. He imbues the tale with tons of snark and sarcasm, allowing characters to be both human and vulnerable. Yes, it's a very violent book with some serious conflicts, but it never loses its playful heart. As for the pacing, it literally races along, making you wonder how he can possibly hope to resolve everything before the end. Much of that sense of fun comes from the characters themselves. They're well-rounded, well-developed, and perfectly suited to their world. These are professional rulers and warriors who take dinosaurs for granted - as they should - and who have real affection for their mounts. Karyl is our primary protagonist, a minor Duke with the smarts and the bravery to step in when needed (and, as a result, dies twice early on). Of course, it helps that he rides a Triceratops, the country's greatest native predator. 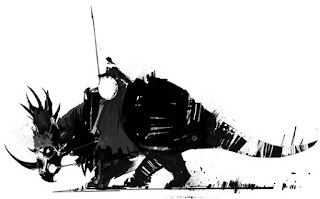 Falk is the young (yet more significant) Duke who proves that not all nobles are useless in battle, a clever man who rides (of all things) and albino Tyrannosaurus rex. Jaume is the eloquent, poetic, amorous Count who loves his men (sometimes too much), and who struts about atop a Corythosaurus casuarius. I could go on, but suffice to say there are both commoners and nobles here, soldiers and rulers, and even a plethora of princesses who get some great lines and some fantastic scenes. Now, generally, my brain tends to fog up and my eyes gloss over with extended scenes of battle. I enjoy them, and can appreciate them, but don't go out of my way to really focus on watching them play out in my head. Not here. Here, I was engrossed in every battle, envisioning each charge, each clash, and each terrifying death. These dinosaurs are as fast and as smart as we've ever seen on screen, their instincts honed by centuries of training. In some cases, they're the heavy artillery you sacrifice in a desperate attempt to break enemy lines, but more often they're precision instruments, used to bite, and tear, and gore as their riders hack and slash above them. Seriously, these aren't just wild beastly blindly carrying their riders into battle, they're well-hone fighting machines with a specific role to play in the battle. Suffice to say, I'm already desperate for a second volume, and this one hasn't even officially hit the shelves yet! It doesn't matter whether your tastes run more towards epic, heroic, or military fantasy, so long as you have a healthy admiration for dinosaurs, you'll be completely enthralled by The Dinosaur Lords. Yes, it's a fun gimmick that's design to pull you in, but both the story and the storytelling are worth sticking around for. I've been waiting for your review of this one. Definitely adding it to my queue now! well colour me depressed because I can't get my paws on the book :(( And it ain't like I haven't tried... and now I'm even more desperate after this stunning review of yours, Bobson.... Damned be Hollywood if they don't turn this into a movie! I literally just started this one yesterday, so I'm going to come back after I finish as I want to go into it with fresh eyes, but all I saw was that you are desperate for the second volume and I can't tell you how excited this makes me! Yeah, I do want to read this. I want this noooow. Why is the release still soooo far away? I can't describe how happy I am to here that the blurb on the cover is exactly as promises. I had no idea about the art in the book though. Richard Anderson is one of my favorite artists; I love his style!